Unlike the last post, for a third issue, I did not forget Taskmaster #3 was coming out this week. This is easily one of my favorite titles of the year for so many reasons. With that said I will speak of just one reason because it is getting late and I have record television shows to get to (I love and hate DVRs). The comic of the day, and the series in general, has become a fast favorite of mine because Fred Van Lente writes the mini series in a way that reminds me of Warren Ellis's Nextwave. Taskmaster is filled with off the wall villainous characters and flippant goofy dialog which was a staple of the Ellis 12 issue Nextwave run (which I own in both individual issues and trade paper back). Plus, the partial plot of Taskmaster #3 involves a town that thinks they are all Hitler because they have been drinking water filled with leaking Hitler cloned brain-juice. That ol' story. The thing that sets Taskmaster apart from Nextwave is that Taskmaster involves the actual Nick Fury and not some mocking knock-off named Dirk. Plus, there seems to be an actual interesting semi origin story wrapped-up in a wild ride...which involves S.H.I.E.L.D, by the way. Taskmaster, the character, is seemingly more important to the Marvel Universe than readers knew (and probably originally intended). 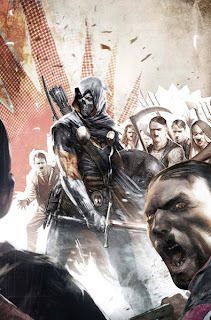 If I could ask for one thing after Taskmaster's mini concludes, it would be that Taskmaster shows up in some Secret Warrior books along side Fury. I'll have to see how the final issue ends, and if Taskmaster finds his way to the side of good once again.